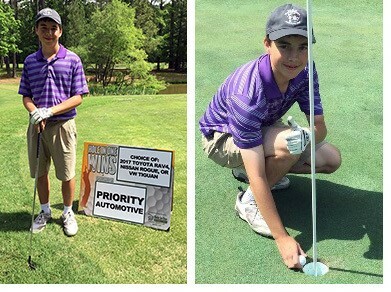 Petersburg, Va. – Proving that hole in one coverage winners come in all shapes, sizes and even ages, 17-year-old Ashton Tudor of Colonial Heights, who won his choice of a 2017 Toyota Rav 4, Nissan Rogue or VW Tiguan, courtesy of Priority Automotive, and paid for by Hole In One International. Tudor won his choice of vehicles, valued at $25,000, after he aced the 165-yard 11th hole, with a 6-iron, at the Chesdin Landing Golf Club during the 36th Annual Priority Kiwanis “K”Lassic Golf Tournament. Tudor, who has been playing golf since he was 7, also plays for his high school golf team. However, this was his first hole in one. And talk about a great prize, what teenager wouldn’t love to win a car playing golf? Regardless of the age of your golf tournament players, hole in one coverage makes it easy to offer rewarding prizes. For more information on creating an enticing tournament prize package that will help you sell more sponsorships, showcase your brand, or raise more money for your cause, visit our website or give us a call today at 800-827-2249. Who knows… you could end up with a hole in one coverage winner of your own!